If you have been researching top quality spider control solutions you probably already know that Catchmaster 288i insect monitors ( commonly known as spider traps ) are considered a industry standard and are in use by pest control companies all over the United States. 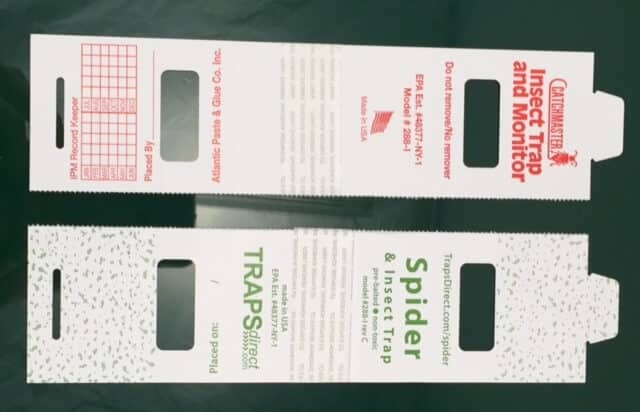 These traps are Instantly recognizable by the red bug logo and Catchmaster IPM ( Integrated Pest Management) matrix. The stark red print makes sense for use in business settings ( including hospital, day care, fast food and dollar stores) because of the need to be easily spotted by the big man when making the rounds monitoring the spider traps. The rise of web based pest control options has led to many home owners purchasing the 288i insect monitors as a reasonably inexpensive , prebaited, natural, home spider management solution. But in a home setting calling attention to a spider trap is the last thing I want to happen. Pest control at home needs to be more discreet than in industrial settings. Over the years we have received reviews and comments from customers asking for a more subtle type of insect trap. Several big names in consumer based pest control have entered the market offering consumers a larger trap with non-red colors. But at the same time these consumer spider traps come in 4 or 6 traps sizes, boxed or cello wrapped with all of the necessary marketing ephemera... And a consumer price. Traps Direct in conjunction with Catchmaster has kept the industry quality 288i insect monitor heritage and reasonable price and updated it with a more conservative consumer centric style. It seems simple, but makes quite a difference. Take a look at the two sides by side. Notice the far left and right ends that become the roof / top of the trap. The center of the trap carries the description , EPA registration , model and reorder information. The essentials of the insect monitor remain solidly in place while the exterior styling become very apartment and home placement friendly. This entry was posted in Ask Traps Direct, Spider Traps Blog and tagged 288i Catchmaster, brown recluse spider, Green Spider Traps, insect monitor, spider, spider trap anatomy. My pest control company has used the red traps for years. Why didn't someone think of this sooner? I just placed an order!